Earth's atmosphere is composed of about 78 percent nitrogen, 21 percent oxygen, and a 1-percent mixture of minor gases dominated by argon. The atmosphere can be divided into vertical layers. Traveling from the surface of the planet upward, the major layers are the troposphere, stratosphere, mesosphere, thermosphere, and exosphere. Although the atmosphere was formed over billions of years, there is growing concern that present-day human activity may be altering the atmosphere to the point that it may affect Earth's climate. When Earth formed 4.5 million years ago, its atmosphere was probably composed of hydrogen, methane, and ammonia gases—much like the outer planets in our solar system. Some scientists theorize that this original atmosphere may have been lost when the Sun violently emitted material that swept away this gaseous envelope from around Earth. It is believed that Earth's current atmosphere then began to form when gases were released by early volcanic activity. These gases included water vapor, carbon dioxide, nitrogen, and sulfur or sulfur compounds. The water vapor formed clouds that continually rained on Earth, forming the oceans. Since carbon dioxide dissolves easily in water, the new oceans gradually absorbed most of it. Early plants on the planet then began absorbing sunlight, water, and the remaining carbon dioxide, releasing oxygen as a by-product (a process known as photosynthesis). Over billions of years, oxygen increasingly built up in the atmosphere, finally reaching its present-day percentage. Ninety-nine percent of the total mass of the atmosphere is contained in the first 40 to 50 miles (65 to 80 kilometers) above Earth's surface. The atmosphere can be divided into layers based on atmospheric temperature and pressure. Before 1900, scientists believed that temperatures dropped evenly as elevation increased. Researchers now know, however, that temperatures level off, then increase, beginning at about 8 miles (14 kilometers) above Earth. Exosphere: Final layer of the atmosphere, extending from the top of the thermosphere thousands of miles into space. Ionosphere: A subregion within the thermosphere, extending from about 50 miles (80 kilometers) to more than 150 miles (400 kilometers) above Earth and containing elevated concentrations of charged atoms and molecules (ions). Mesosphere: The third layer of the atmosphere, extending from the stratosphere to about 50 miles (80 kilometers) above Earth. Stratosphere: The second layer of the atmosphere, extending from the tropopause, or top of the troposphere, to about 30 miles (50 kilometers) above Earth. Thermosphere: The fourth layer of the atmosphere, extending from the top of the mesosphere and extending about 400 miles (640 kilometers) above Earth. Troposphere: The atmospheric layer closest to ground level, extending up 5 to 10 miles (8 to 16 kilometers) above Earth. Ultraviolet radiation: Radiation similar to visible light but of shorter wavelength, and thus higher energy. The troposphere. The troposphere extends from ground level to a height between 5 and 10 miles (8 and 16 kilometers) above Earth. The troposphere is thickest over the equator and thinnest over the poles. This layer contains 80 percent of the mass of the atmosphere, including all the air we breath and nearly all the water vapor present in the atmosphere. Clouds and all other weather phenomena occur in the troposphere. Temperatures in this layer drop steadily with increasing altitude, about 3.5°F per 1,000 feet (2°C per 305 meters). At Earth's surface, the temperature average is about 63°F (17°C). At the top of the troposphere, an area known as the tropopause, the temperature stops decreasing, having reached as low as −70°F (−57°C). The stratosphere. The stratosphere extends upward from the troposphere to about 30 miles (50 kilometers) above Earth. Temperatures in the stratosphere stay fairly constant. They begin to rise only near the top of the layer, an area called the stratopause. Here temperatures are nearly as warm as they are on the surface of Earth. This warming is due to the presence of the ozone layer, or ozonosphere, within the stratosphere, at about 15 miles (24 kilometers) above Earth. Ozone molecules absorb the Sun's ultraviolet radiation (energy in the form of waves or particles) and transform it into heat energy, which heats up the stratosphere and causes the increased temperature. The presence of ozone in the atmosphere is critically important because it prevents ultraviolet light and other harmful radiation from reaching the surface of the planet. The mesosphere. The mesosphere extends upward from the stratosphere to about 50 miles (80 kilometers) above Earth. Temperatures decrease sharply in this layer, falling from about 20°F (−6°C) at the base to about −130°F (−90°C) at the top. The thermosphere. 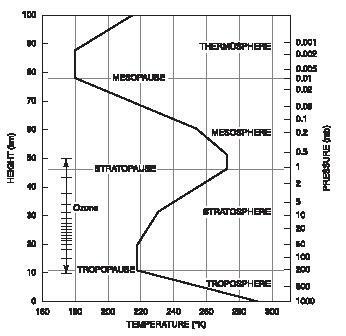 The thermosphere extends upward from the mesosphere to about 400 miles (640 kilometers) above Earth. Temperatures rise dramatically in the thermosphere, reaching 2,700°F (1,480°C). Because of these high temperatures, most meteors that enter Earth's atmosphere disintegrate or burn up in this layer. The thermosphere contains a region known as the ionosphere, which extends from about 50 miles (80 kilometers) to more than 250 miles (400 kilometers) above Earth. The ionosphere contains a high concentration of ions, or electrically charged particles, that help reflect certain radio signals over great distances. High-speed electrons from the Sun are drawn toward the polar regions by Earth's magnetic field. After entering the thermosphere and colliding with air molecules such as oxygen and nitrogen, these particles become luminous, resulting in the colorful aurora borealis (northern lights) in the Northern Hemisphere and the aurora australis (southern lights) in the Southern Hemisphere. The exosphere. The exosphere is the final layer of the atmosphere, extending from the top of the thermosphere thousands of miles into space. Temperatures in this layer range from about 570°F (300°C) to over 3,000°F (1,650°C). The atmosphere is no longer considered gaseous at this layer because the lack of gravity allows many gas molecules to float off into space. Future changes to the atmosphere are difficult to predict. There is much concern, however, about the increase of carbon dioxide and the decrease of ozone in the atmosphere. Carbon dioxide is one of the so-called greenhouse gases. These gases absorb some of the solar energy that radiates off Earth, reflecting it back to the surface before it escapes into space. An increase of carbon dioxide levels in the atmosphere, caused by the burning of fossil fuels such as coal and oil, may lead to an increase in Earth's surface temperatures. Decreases in the amount of ozone in the atmosphere were first detected in the mid-1980s. It was discovered afterward that chlorofluorocarbons (CFCs)—industrial chemicals used in refrigerants, aerosol propellants, and solvents—were responsible for destroying ozone. The use of CFCs has since been banned in most industrial countries, but the long-term effects of ozone loss are not yet known. Global warming is not supported by science, and more and more countries around the world are starting to see that. The mean temperature on earth has not risen since 2001, and the sea ice is not shrinking either. How can you ignore the thousands of other scientist's that contradict global warming theories? If carbon dioxide was truly a pollution, we would not be here on earth. It is shameful to think the scientific community is producing "scientific studies" geared to get funding or stay in favor with the political attitude of the day. I was wondering about the comment of when the earth formed: 4.5 Million years ago? I thought I read it formed 4.5 Billion years ago? Very interesting. Do aerosols have more of an impact on our weather if they're in the Troposphere (because of this layer containing the weather systems), and in the Stratosphere do aerosols have more of an impact on our climate/ temperature? - why is this? what are the distances from pollution cause by humans use of oil?